Qualifying finals of the Sandman Hotels Penticton Open saw two Canadians and the Club Pro progress to the main draw of the inaugural $5k event. Joey Forster took a hard first game with George James, controlling the front of the court at the start of the game. Joey then started to find his length and controlled the T and took away James' legs to complete a straight-games win. The second match of the day was between club pro Adam Terheege and Kelowna's Joel Casey. It was a close first game with Terheege looking to go short towards the end of the game, which worked very well for him, some great gets by Joel. Casey looked to tire with Terheege hitting with hard pace throughout and hitting volley drop after volley drop. In the next two games Terheege hit hard again and took the match with a nice roll out. "I'm looking forward to playing the number one seed Nathan Lake now," said Terheege. The match of the day was between Andrew Braff and Hamid Khosrowkiani, which went to the wire. Hamid looked nervous throughout the match, making lots of mistakes as the first four games were shared. Braff got a let call at 9-9 in the decider which was a tight call, and eventually lost 11-9. Hamid will be relived he got through that one. 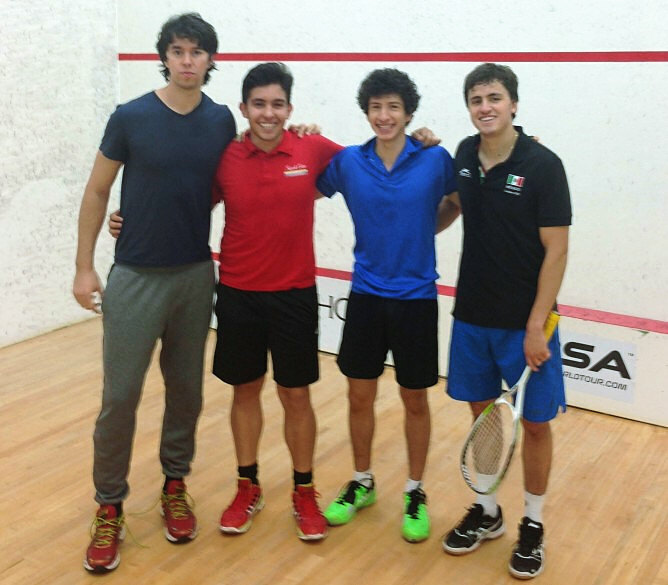 The final match saw local Pentciton boy Gord Henderson battle hard against Mexican Marco Toriz-Caddo. At 6ft 5 Marco looks like he could cause an upset in the first round, and snapped his Achilles last year it is amazing to see him back on court after a long spell on injury table.